Quel joli gâteau elle a de la chance ! Elle a pas l'aire très heureuse sur les deux premières et la dernière! Soiré retour en enfance on diraient, je veux des bonbons!!! XD Et sinon, j'adore trop sa robe! Merci pour les photos. J'ai hâte d'en voir plus! ça fait du bien que la revoir officiellement. ps : merci de mettre la date des photos dans le titre du topic. Merci pour ces photos, elle est déjà beaucoup plus souriante, et le guateau WAW ils ont du mettre des heures a le faire! De nouvelles photos + avec Joe Jonas. J'ajouterai d'autres photos demain en tout cas Ashley est juste superbe !! Oui, c'est vrai qu'elle était magnifique. De plus sa faisait longtemps que l'ont ne l'avaient pas vu! D'ailleurs vivement le début de la Promo de Breaking Dawn qu'on puisse la voir plus régulièrement ! la robe est superbe aussi ♥ ! le cadeau de joe pas mal !!! nouvelle image le bracelet chanel qu'Ashley a recu en cadeau de Joe Joans : "Le truc marrant quand j'ai reçu mon cadeau c'est que mon copain m'a dit que c'est un Coach et quand je l'ai mis j'ai vu que c'était marqué Chanel. Ça m'a vraiment fait plaisir car il connait mes goûts. Coach, Chanel, ça ne fait pas de différence pour lui... Je l'adore car il me correspond". oui, du cadeau (( j'ai vu le prix je sais plus où, mais c'est éleve ^^ )) ! Before she whooped it up with pals at Las Vegas' PURE Nightclub on Saturday, Ashley Greene's birthday weekend kicked off with a low-key dinner at STK in West Hollywood on Friday. Organized by her beau Joe Jonas, a source tells UsMagazine.com that the Disney star visited Greene's "favorite restaurant" earlier in the afternoon to oversee every last detail -- including arranging for a scrapbook and a bouquet of flowers to be on display when they arrived together later that evening. "This is her first birthday they've spent as a couple, so he wanted to make sure everything was perfect," the insider says. "He was really sweet and conscientious, making sure everything worked out okay." Dressed in a lacy black mini, Greene and Jonas, 21, joined 15 of the actress' closest friends -- including her Twilight costar Kellan Lutz -- for a champagne toast. "Joe had his arm around Ashley the whole night," an eyewitness tells Us. Though the party ended just before midnight, Jonas' sweet surprises were far from over: he later gifted Greene with a vintage Chanel bracelet, which she wore to the Vegas fete the following night. "The funny thing about it is when I got it, my boyfriend said it was vintage Coach," Greene told reporters. "It was very cute and sweet and adorable to me because my boyfriend gave it to me. Coach, Chanel -- it makes no difference to him, but to me this is amazing. I thought it was adorable and I absolutely love it because he knows what I like." "Thank you to all my incredible friends family and fans for the sweet birthday wishes," Greene tweeted early Sunday morning. "I'm a very lucky girl to have you all in my life." 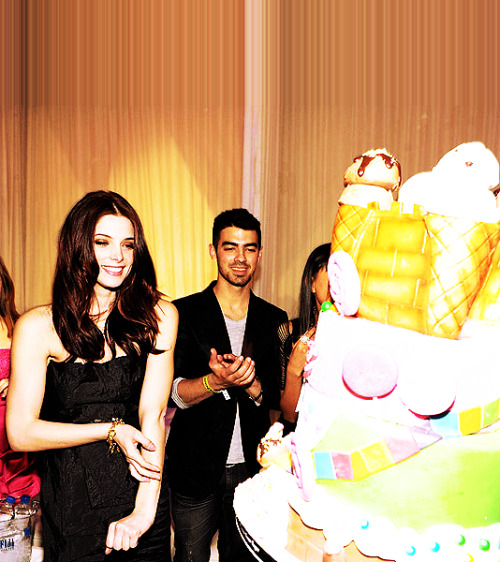 Joe Jonas Got Ashley Greene What for Her Birthday!? Ashley Greene is all grown up! The Twilight starlet celebrated her 24th birthday in Las Vegas this weekend, and her younger boyfriend Joe Jonas was on hand at a Candyland-themed bash. Ash hit the carpet solo at Pure nightclub, as Joe was happy to let the birthday girl be the center of attention. He didn't even know the jewelry designer of the birthday gift he gave her! "I just got the charm bracelet I'm wearing," she said on the carpet. "It's vintage Chanel and the funny thing about it is when I got it, my boyfriend said its vintage Coach. It was very cute and sweet and adorable to me, because my boyfriend gave it to me. Coach, Chanel makes no difference to him—but to me this is amazing!" Aww, Joe is clearly clueless about designers, but it's the thought that counts! Ashley was clearly pleased with her birthday present, as she made no effort to hide her affection inside the club. "They were kissing, holding hands and dancing with each other," a source tells me. Twilight actress Ashley Greene celebrated her 24th birthday at Pure at Caesars Palace last night and early this morning with a Candy Land-themed party and boyfriend Joe Jonas of the Jonas Brothers. Upon arrival, Ashley walked up to the line of fans, posed for photographs and chatted with them. Meanwhile, Joe was escorted inside the newly awarded Mega Nightclub of the Year through the side entrance while Ashley dazzled in a strapless black dress on the red carpet. Ashley showed off her birthday gift from Joe, a vintage Chanel charm bracelet. Our spywitness reported that during an interview with Pure’s TV crew, Ashley gushed about the early surprise from Joe. “I just got the charm bracelet I’m wearing, it’s vintage Chanel, and the funny thing about it is when I got it, my boyfriend said it’s vintage Coach,” she said. “It was very cute and sweet and adorable to me because my boyfriend gave it to me. 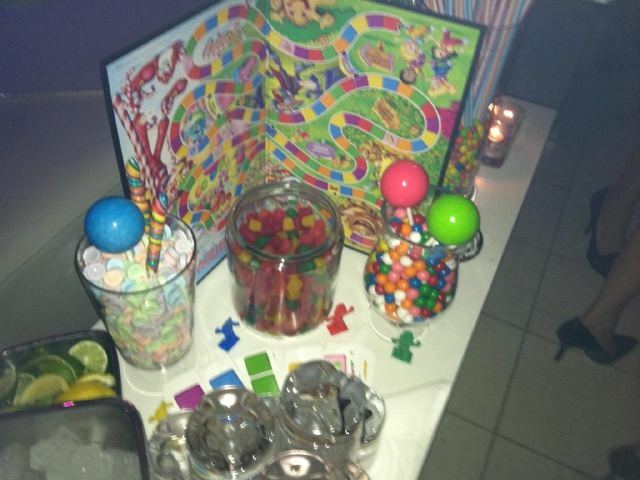 Inside Pure, Ashley joined Joe and her friends at VIP tables on the main stage decorated in a Candy Land theme, including the classic board game, a candy area full of her favorites and giant 3-pound lollipops for her special day, which is tomorrow. Ashley and Joe played with the decorations and joked around about the weight of the lollipops. The couple kissed, held hands and danced throughout the night. 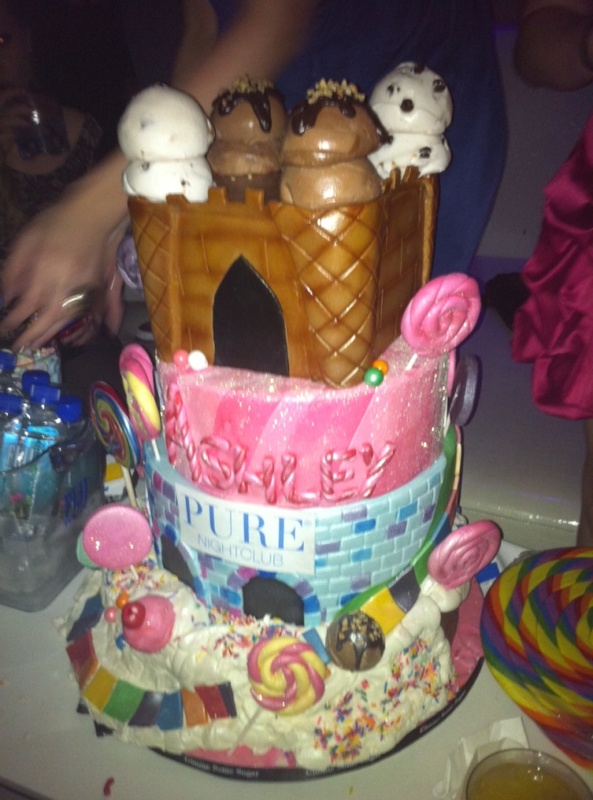 After her friends joined her, Ashley was presented with a large Candy Land-themed birthday cake, with everyone wishing her “Happy Birthday.” The entourage continued the celebration until the wee hours of the morning.